LAS VEGAS (Friday, January 24, 2014) – Jose Arias, an environmental safety engineer from Bell Gardens, Calif., leads the Daily Racing Form/NTRA National Handicapping Championship (NHC) Presented by Racetrack Television Network, Sovereign Stable and Treasure Island Las Vegas after Day 1 with a $198.80 bankroll. As Day 1 leader, Arias earned a $6,000 bonus, as well as paid Breeders’ Cup Betting Challenge entry fees, live bankrolls, airfare and hotel. The top five Day 1 leaders earned bonuses. Rich Pawloski sits in second with $172.20 and earned a $5,000 bonus, followed by Tony Brice ($169; $4,000), Mike McIntyre ($168; $3,000) and John Wilhelm ($167.20; $2,000). The Top 10 was rounded out by Chris Skotz ($161), Francis Boustany ($158.60), Robert Bertolluci ($154.60), Craig Hom ($149) and Mike Hackworth ($140.40). The full standings can be viewed at ntra.com. The 500 NHC entrants were required to place 15 mythical $2 Win and Place wagers – seven on mandatory races that everyone played and eight on any of about 50 other races from seven designated racetracks across the country. Arias leapfrogged to the top of the standings by picking the 21-1 winner of the day’s final mandatory race, the seventh at Santa Anita. The $58,000 allowance for older females on the downhill turf course was won by Macaabra, who paid $44.20 for a $2 Win wager and $12.80 for the $2 Place bet. For NHC purposes, payoffs are capped at 20-1 ($42) to Win and 10-1 ($22) to Place. Despite holding a lead in the world’s most prestigious handicapping tournament, the 36-year-old insists he won’t lose any sleep tonight. Only one Day 1 leader has ever gone on to win the NHC – Brian Troop in 2010. That year, Troop posted what was then the highest single-day total in history with $232.60 on Day 1. Last year Richard Grosse tallied a single-day record of $235.60, but for 2013 only the format included $4 Win-Place “Best Bet” options, one of which Grosse hit with a $76 winner. 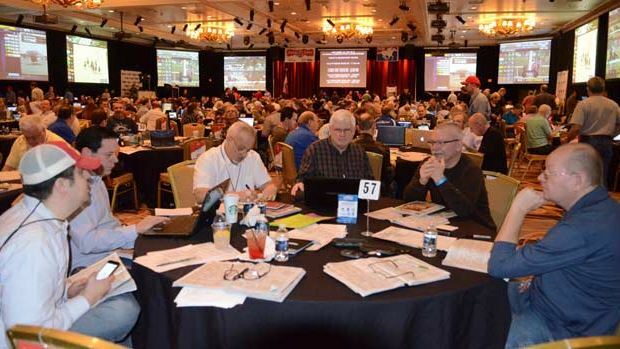 The three-day NHC continues Saturday at Treasure Island Las Vegas. Day 1 bankrolls will carry over to Day 2, which will have eight mandatory races and seven optionals. The top 50 after Day 2 will continue on to a “Final 50” tournament Sunday and the top 10 will play at the “Final Table” to determine the final rankings, including the $750,000 grand prize and Eclipse Award winner. Players outside the Final 50 will play in a separate $75,000 Consolation Tournament on Sunday with reset mythical bankrolls.